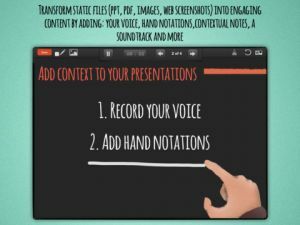 bContext transforms the way ideas are shared by enlivening static documents (ppt, pdf, image) with audio, writing, and drawing capabilities. The app makes it easy for anyone (e.g. teachers, sales professionals, designers, architects, consultants, bloggers, journalists etc.) to produce more engaging content. To use bContext, simply open a standard file (.PDF, .PPT, .JPG, or .GIF) from the app. Then audio record a session while simultaneously writing or drawing on the screen. There are tons of tutorials on bContext that easily demonstrate all the tools for recording, writing and editing. 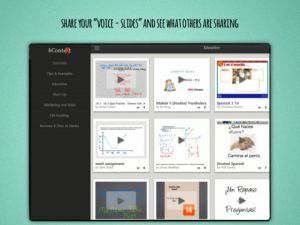 Anyone can view the recorded “Voice-Slides”. 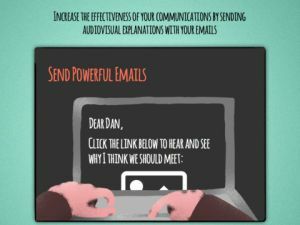 Links can be shared by email and can be viewed on any computer or mobile phone with an HTML5 compatible browser. 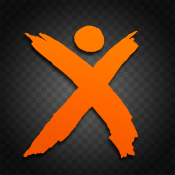 bContext also offers features to track views, providing you with advanced analytics such as the number of views, the length of views, and other viewership data. 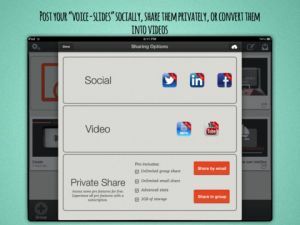 Users can easily share their Voice-Slides via Twitter, Facebook, LinkedIn, YouTube, or Email. 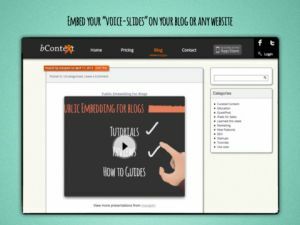 Voice-Slides can also be embedded on blogs or any website for free. • Import photos from iPad camera roll, Dropbox, etc. Otra excelente aplicaci�n para crear v�deo tutoriales. Se diferencia de otras en su capacidad para mejorar los v�deos, pues te permite volver a grabar la voz si te equivocaste e, incluso, editar de nuevo, Adem�s posee gran cantidad de pr�cticos tutoriales..
La aplicaci�n permite crear v�deo tutoriales, por lo que se convierte en el sustituto ideal de la pizarra tradicional, con la gran ventaja que supone para los alumnos el poder llevarse las explicaciones del profesor a casa, para poder repasar tantas veces como quieran.